Each time I come home from Bali, I find myself craving one dish: mie goreng. And sure enough, within two weeks of my last return from my favorite island, I just had to have it. And that’s where this mie goreng recipe came into the picture. If you’ve been to Bali — or anywhere in Indonesia — then I’m sure you’re very familiar with mie goreng, since you can find it on the menu at most traditional warungs! However, if you haven’t met mie goreng yet, then let’s get you two acquainted. Mie goreng is a scrumptious, traditional dish of fried noodles found throughout Indonesia (and also Malaysia). A good mie goreng is equal parts sweet, salty, and umami, and packed with fresh vegetables and tender chicken and/or shrimp. And just as a good mie goreng’s flavors are deep and varied, so are its textures; between the chewy noodles, fried shallots, fresh vegetables, crunchy bean sprouts, scrambled eggs, and succulent proteins, there are lots of interesting textures going on in each bite. There are very few (if any?) noodle dishes I love more than this one, and I know you’re going to feel the same way. The flavors and textures bring me right back to Bali — my happy place. 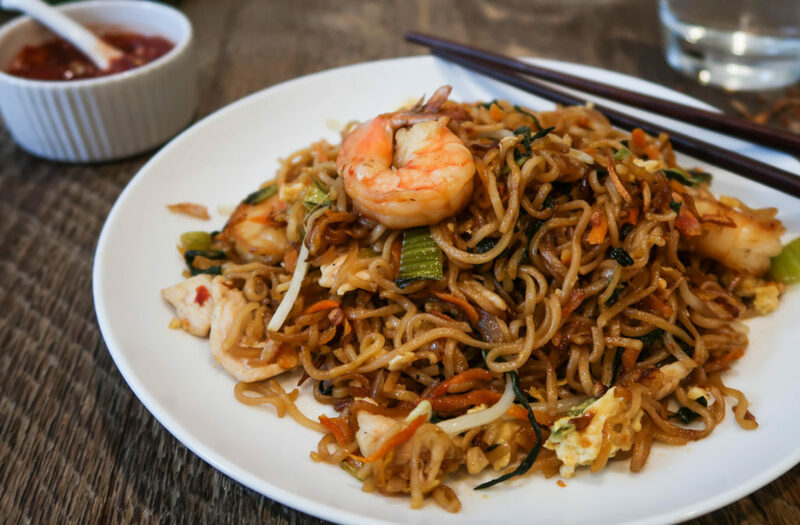 Most people don’t know what mie goreng is, let alone how to make it. Mie goreng makes for a very special, uncommon meal. It’s fairly easy to throw together. 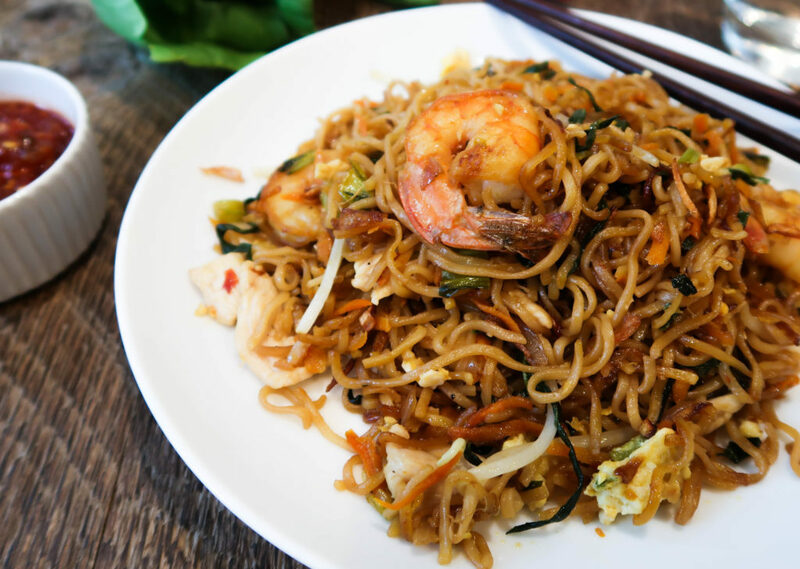 For this mie goreng recipe, you may need a few items you don’t already have. Luckily, though, once you have them, you will use them again, and again, and again. I was not able to find kecap manis in my local grocery store, despite having a fantastic Asian foods aisle. You can purchase kecap manis via Amazon here. Sambal oelek may be easier to find, but you can also purchase it via Amazon here. Finding oyster sauce in your local grocery store might be tricky. You can puchase it on Amazon here. I couldn’t find Chinese egg noodles on Amazon or in the grocery store! Instead, I used these ramen noodles (discarding the flavor packet). Life wouldn’t be the same without a wok. If you don’t have one already, then I highly recommend this wok! Plus, it’s a steal at only $29! 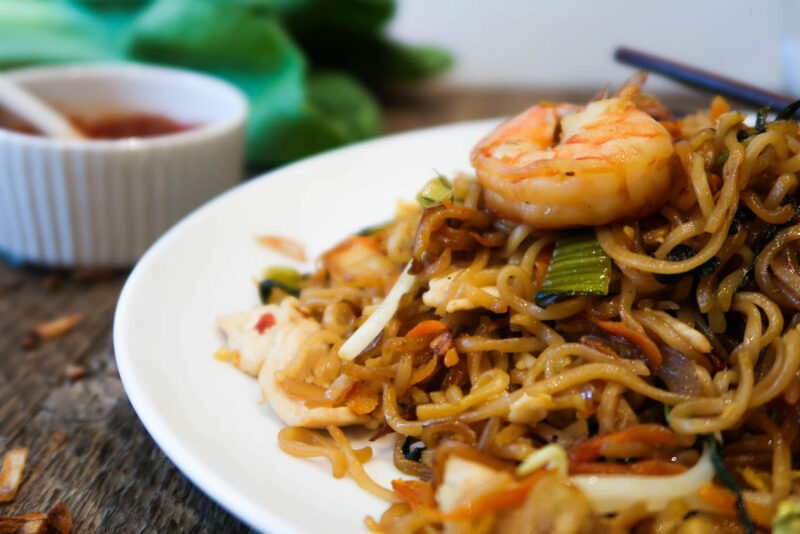 This mie goreng recipe is very easy to make. The hardest part is simply waiting for your special items to arrive in the mail! Once you have your kecap manis, sambal oelek, oyster sauce, noodles, and a wok, this recipe is so easy to throw together. 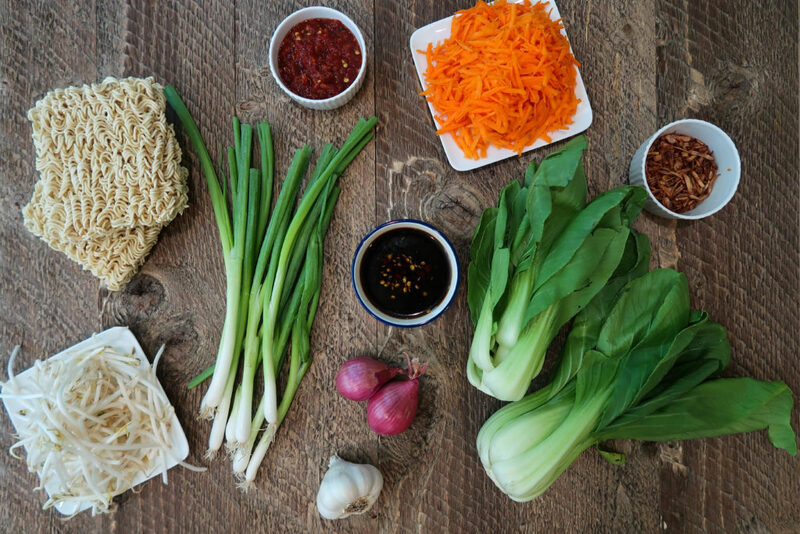 All that’s left to do is a bit of chopping and stir-frying, and you’ll be ready for your Indonesian fried noodle feast! To make this mie goreng recipe, start with the sauce. In a bowl, you’ll whisk all of the liquids together, and then set it aside. Then fry up the shallots in some vegetable oil until they’re golden brown and crispy, place them on a paper towel to extract any excess oil, and set them aside. Next, cook your chicken and/or shrimp and set that aside, too. Now, it’s time to stir-fry your shallots and garlic, followed by your bok choy and carrots. Then, a few minutes later, you’ll add in your al dente noodles and the sauce, and stir very occasionally — you want your noodles to fry up and get crispy, so you shouldn’t move them around too much. After your noodles are cooked to perfection, move everything to one side of the wok and scramble your eggs on the other side. Add in the cooked chicken and/or shrimp, bean sprouts, and fried shallots, and mix everything together. If desired, garnish your mie goreng with some more sambal oelek and fried shallots, and maybe even some crushed peanuts! Then enjoy every last bite. Though something tells me you won’t need to be prompted to do so. This mie goreng is that good. If you’re like me, and you constantly find yourself missing beautiful Indonesia, then I promise that this mouthwatering mie goreng recipe will bring you right back! If you close your eyes, you might even believe that you’re feasting at a busy roadside warung in Ubud or sitting on a beach in Jimbaran. And if you have’t tried mie goreng yet, then I highly recommend you do! Sweet, spicy, savory, chewy, crunchy, fresh, and succulent are just a few of the words I’d use to describe the complex bomb of flavors and textures that makes up mie goreng. Don’t you just need that kind of deliciousness in your life? A good mie goreng is equal parts sweet, salty, and umami, and packed with fresh vegetables and tender chicken and/or shrimp. And between the chewy noodles, fried shallots, crunchy bean sprouts, scrambled eggs, and succulent proteins, there are lots of interesting textures going on in each bite! For the sauce, whisk liquids together in a bowl. Set aside. For the fried shallots, heat oil in the wok. Fry shallots until crispy and golden brown. Place them on a paper towel to extract any excess oil. Set aside. For the chicken, thinly slice, season with salt and pepper, and stir-fry in oil until tender. About three minutes. Set aside. For the shrimp, season with salt and pepper, cook in butter for about one minute on each side, or until cooked through, but tender. Set aside. If needed, add more oil to the wok and heat. Add in other (raw) shallots and garlic, stirring constantly to avoid burning. Cook for two minutes. Add in bok choy, stirring constantly for two more minutes. Add in carrots and continue stirring for two more minutes. Pour in sauce and noodles (previously cooked to al dente). Stir everything together, then allow for the noodles to fry and get crispy. About five to seven minutes. Stir occasionally, just enough to avoid burning. Once noodles are crispy, move everything to one side of the wok. Scramble the eggs on the other side. Add in chicken, shrimp, bean sprouts, and fried shallots and mix everything together. Remove from heat and serve. If desired, garnish with sambal oelek, fried shallots, and/or crushed peanuts. For this recipe, I recommend using a wok, which is a Chinese-style stir-frying pan. If you don't have one already, then I highly recommend this wok! It is only $29 on Amazon. I checked three grocery stores and couldn't find this sauce. You can purchase kecap manis on Amazon here. You may be able to find this, but you can also purchase sambal oelek on Amazon here. Oyster sauce may also be tricky to find. You can purchase oyster sauce on Amazon here. I couldn't find Chinese egg noodles on Amazon or in the grocery store. Instead, I used these ramen noodles (discarding the flavor packet). Cook the noodles in boiling water until they are al dente. Then add them into the wok when instructed. 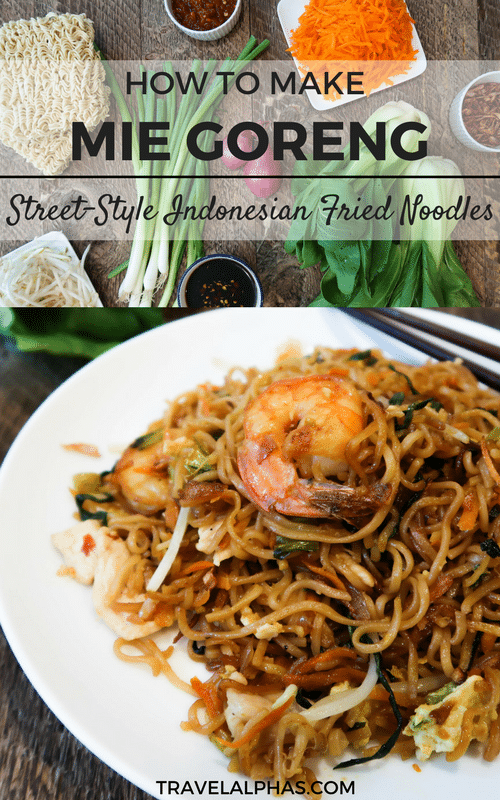 Did you make our mie goreng recipe? Let us know how it went in the comments section below and tag @travelalphas and #travelalphas in your photos on social media! If you have any other questions, leave them below. YUM! This sounds so good. I’ve never tried it before, but it definitely sounds like my type of meal. Loving the food shots too; your photography skills are on point, as per usual. YAY! SO HAPPY! Thanks for pointing out that I forgot to add the eggs into the ingredients list – I’ve fixed that.